As many who start up a company begin with a great idea, with a laser focus; it seems as soon as you get started, you start to get distracted by other priorities, or begin adding additional features or strategies for no apparent reason other than to please as many people as possible. As Bill Cosby once said, "I don't know the key to success, but the key to failure is to try to please everyone." With that in mind, there is a great Hindu epic from the 3,500-year-old Mahabharata, one of the three sacred texts of Hindu, that tells of a story about the five Pandava brothers: Yudhisthira, Bhima, Arjuna, Nakula and Sahadeva. These brother where the great warriors of ancient India, and one in particular, Arjuna, has a fantastic story of purpose and calling in the Bhagavad Gita. But that is another story. In any case, this story begins with the brothers' archery teacher's instruction on aim and targeting. The master ties a wooden fish to a tree branch over a basin of water. The master tells the Pandava brothers that they must shoot the fish's eye with their bow and arrow but only by looking at the fish from the reflection in the basin of water. The eldest brother, Yudhisthira, goes first. 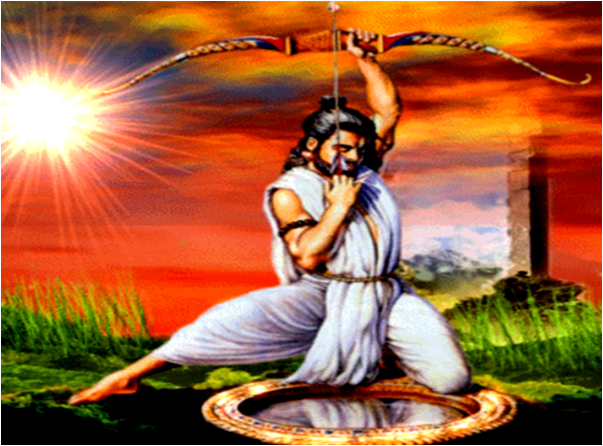 Before aiming his bow and arrow, the master stops and asks him "Yudhisthira what do you see?" Yudhisthira says, "I see the sky, I see the birds and the fish." The master asks Yudhisthira to not draw his bow and go and sit down. Then the master calls upon Bhima, the second eldest son. Again he asks the question, "Bhima, what do you see?" Bhima says, "I see the tree, the branches, the leaves and the fish." Once again the master asks Bhima to sit down. Finally, it is Arjuna's turn. Arjuna steps forward, positions himself with his bow and arrow above the basin, and the master asks him, "Arjuna what do you see?" Arjuna responds by saying, "I see only the fish's eye." The master tells Arjuna, "Then draw you bow my son, and shoot." The point of this story is that when you are distracted like the first two brothers by other things, you cannot possibly hit your target. Arjuna knew that, and when he looked into the water all he saw was the fish's eye and that is all he aimed for. In all things, we often get distracted by people, events, family dramas, and situations that do not really matter and take us away from the work and goal at hand. If you are doing a startup, this is critically important! If you do not focus on the 'fish eye' of you goals, you will waste valuable time, effort, and resources. You will oscillate between one task to another, essentially accomplishing little or nothing. Focus only on your fish eye, do not admire the fish even if that is the goal you want. This wisdom has been around for ages, and is as appropriate today as it was 3,500 years ago. I hope you heed it.